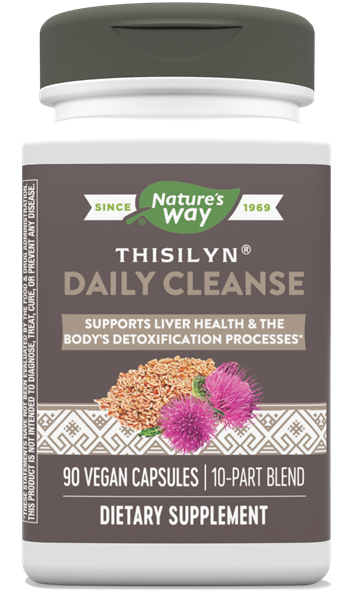 Thisilyn Daily Cleanse / 90 Vcaps - Nature's Way®. Your liver is responsible for filtering your blood, secreting bile and neutralizing toxins, which are the elements of good digestion. When functioning properly, a healthy liver helps clear toxins and other impurities from the blood. Take 3 capsules in the morning and 3 capsules in the evening. Always take with a full glass (8 ounces) of water. Take this product with at least a full glass of liquid. Taking without adequate liquid may cause choking. Do not take this product if you have difficulty swallowing. Do not use if you have bile duct obstruction, gallstones or intestinal obstruction/inflammation. Do not use if you are allergic to plants of the Asteraceae (Compositae) family including ragweed. If you experience chest pain, vomiting or difficulty swallowing or breathing after taking this product, seek immediate medical attention. If pregnant, nursing, have gastrointestinal disease, or you are taking any medications, consult a healthcare professional before use.